Runners Knee is also called Patellofemoral Pain Syndrome or Patellofemoral Stress Syndrome or Anterior Knee Pain Syndrome. It can be chronic or intermittent. It is common in runners, hence the term "runners knee", but also occurs in inactive people. 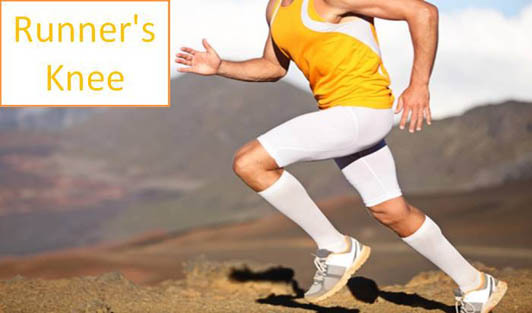 Runners Knee is a condition characterized by pain behind or around the kneecap. Poor kneecap tracking is the main cause of this. Muscle imbalances in the lower body, especially the quads are common. Tightness of the muscles and tendons can also pull the kneecap toward one side. Mechanical errors include misaligned joints in the foot or ankle; a kneecap that is located too high in the joint; flat foot. Rest: Temporarily avoid activities that cause extra stress on the knees. Icing: Applying ice to the knee, especially after exercise may reduce pain and swelling. NSAIDs: Non-Steroidal Anti-Inflammatory Drugs such as Aspirin or Advil, as recommended by your doctor. Exercise: Exercises, particularly exercises to strengthen and stretch the quadriceps (front thigh muscles) and hamstrings (muscles of the back of thigh). Spending a few minutes, a couple of times a day on these muscles and gradually working up to 20 minutes per day are sometimes all that is needed. • Surgery: Surgery for Runners knee should be a last resort; after an exercise program to correct muscle imbalances has been given a fair trial. It may be necessary if there are significant structural abnormalities.